Every Twitter user knows what a blue check mark means: Status, some amount of celebrity, recognition that this specific tweeter is a VIP in some way. It’s a huge boon to get a verification badge next to your Twitter handle. Twitter doesn’t hand out the coveted status symbols to just anyone. According to its Help Center, Twitter proactively verifies accounts for “highly sought-after users” from a variety of fields, as well as people at risk of impersonation. In other words, don’t call them – they’ll call you. So what’s an up-and-coming, hungry-for-success fledgling tweeter to do? Don’t fall for a fake verification account, for starters. According to The Verge, a rash of fake accounts making outlandish claims promising to verify Twitter users are on the loose. 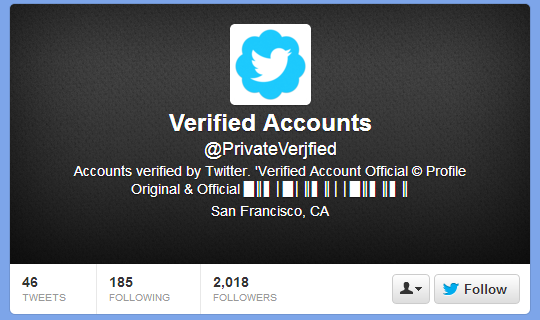 One of the accounts, @privateverified, was shut down after amassing 22,000 followers in under 24 hours. And it’s not clear which one was the initial hoaxer, but now there are a number of different accounts angling for the same trick and steadily gaining followers. Even though Twitter already gave @privateverified and several other fakers the axe, more trickster accounts remain active, though they’re getting increasingly less believable. One of the current perpatrators is going by the name Private Verified, but you can see the Twitter handle is the decidedly less-official-sounding @privateverjfied. It’s only been active for 3 hours and has already garnered over 1,900 gullible, gullible followers. Twitter’s real @Verified handle is a much different beast than these hoaxers, only tweeting four times, and never accepting requests for verification. If you are hungry for that blue badge, your best bet is increasing your profile on the site and hoping Twitter notices. Don’t re-tweet or DM a Twitter account that promises verification. Of course, there are have been some rather shady practices associated with the badge, so be aware that it’s really all under Twitter’s control and discretion. And if you’re wondering how to tell if it’s real or fake, remember that accounts that aren’t verified themselves can’t verify anybody else, and that as of now, you can’t get verified just by sending a re-tweet or following an account. What is it like to actually get verified? Mashable’s Lance Ulanoff outlined the actual verification process, which requires giving Twitter your phone number. But the process is still a head scratch-inducing mystery. No matter how much you want it, it’s better to accept that Twitter’s verification system remains out of your control and frustratingly obtuse — and with that in mind, remember that accounts pretending verification is as easy as a press of a “Follow” button are probably more full of baloney than a grocery deli section.